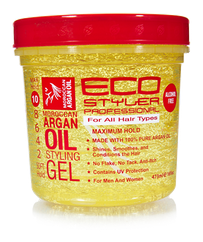 Eco Styler Moroccan Argan Oil Styling Gel shines, smoothes, and conditions the hair. Maximum hold and made with 100% pure Argan oil. Eco Styler Moroccan Argan Oil Styling Gel is formulated with rare oils from the Argan tree in Morocco. The formula conditions and revitalizes the hair while adding a brilliant shine. Moisturizes providing hydration and elasticity to hair. Conditions with Omega fatty acids and Vitamin E to provide nourishment that strengthens hair. The lightweight formula will give you superior hold without weighing hair down. Like all of Eco Styler styling gels this new gel minimizes flakes and tack, and aids in the prevention of dry skin. Provides UV protection with no tack and is anti-itch.